Most folks love a good comedy, especially when there’s something familiar and something peculiar and with Silhouette Stages‘ latest offering, A Funny Thing Happened on the Way to the Forum with a Book by Burt Shevelove and Larry Gelbart and Music & Lyrics by Stephen Sondheim, there’s something for everyone! This latest venture is Directed by Conni Ross, with Music Direction by William George and Choreography by Tina deSimone. In a nutshell, A Funny Thing Happened on the Way to the Forum is formatted much in the same way as the ancient Roman farce and, tells the humorous tale of Pseudolus, a slave, and his cunning plans to win his freedom by helping his young and in love master, Hero, get the girl next door, who happens to be a virgin prostitute (or the ancient Roman version of one). Throughout the story we are presented with classic elements of farce with puns, doors slamming, and mistaken identity, of course, as well as a social commentary on social class. Throw a complex but bouncy score by Sondheim and you have a nice satirical evening of theatre. Alex Porter’s stellar Scenic Design and Set Decoration by Jessie Krupkin and Bill Pond is large and in charge, taking up the entire stage and adding great value to this production. He is wise to choose a unit set, making it easier to move the action along smoothly. Though farce calls for a lot of slamming doors, you won’t find any doors on this set, but it’s okay because, sans doors, the quick entrances and exits are easily made, keeping the momentum up. The Set Decoration and Dressing by Krupkin and Pond is spot on bringing a whimsical feel to the piece, as required. Porter has managed to give us two story structures, as well, which can be tricky when it comes to smaller, community theatres, but the structures seem strong and sturdy and make for a great setting, overall. Krupkin and Pond have a great eye for detail and have created a near perfect comedic rendition of an ancient Roman street including two life-sized Roman sculptures that add great value to the overall design. Porter, Krupkin, and Pond should definitely be applauded for their scenic efforts and execution for this production. Costume Design by Linda Swann is impeccable and fitting for this production presenting the ancient roman setting but also blending in the modern and humor of each character. Swann uses her modern day resources (t-shirts and sunglasses) and mixes them with the more traditional garb of Roman soldiers and citizens to make for a delightful design. When need be, each character is an individual, as well, and all seem comfortable in his or her wardrobe which adds great value to the production. Tina deSimone takes on the responsibility of Choreographer for this piece and though the choreography is a bit elementary and basic, it’s still entertaining and the cast seems to have a great time performing it. It’s fitting for the piece and deSimone is obviously familiar with her casts varied movement experience and manages to create numbers that are easily performed by all. As Music Director, William Georg already had a lot to work with going in because, vocally, this ensemble is quite strong. The use of canned music is a bit offsetting as it seems to bring down the energy, but the cast knows their stuff and Georg has done his job superbly. His cast is in harmony and in tempo in each number and any Sondheim score is a challenge but Georg has definitely risen to this challenge for our listening and toe tapping pleasure. Conni Trump Ross takes the helm of this production and does a commendable job bringing this story to the stage. There are built in challenges with this piece, one being it’s not only a comedy, but also has many farcical aspects and this is a challenge for any cast and director. The story is presented nicely in a traditional setting and the pacing is fantastic but when it comes to the farce, it falls a little flat. One has to have a strong comprehension of farce to direct it and it needs to be flawless to be effective. 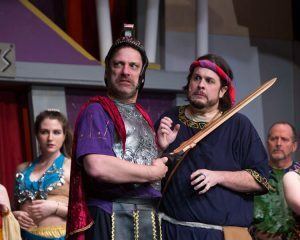 The speed in which a farce is supposed to happen, like rapid fire, just isn’t as strong in this production as it could be, but that’s not to say the production isn’t quick and funny, because it certainly was. The casting is spot on and the piece is well rehearsed and Ross seems to have a good grasp of the material and how to present it, making for a very good showing. Moving on the to performance aspect of this production, it’s worth mentioning that this ensemble is top notch as a whole, they are well rehearsed and really get the humor in this material. For instance, Todd Hochkeppel takes on the role of Erronius, the poor elderly neighbor who is searching for his kidnapped children through most of the show and makes what really can only be called cameos throughout, but… he makes the most of his short time on stage and is absolutely hilarious as the goofy, seeking old man with brilliant comedic timing and a great presence for this character. Tommy Malek tackles the role of Hero, the lovelorn boy next door to Rachel Sandler’s Philia, the virginal, naïve prostitute next door. Both of these actors have a good understanding of his or her character and though Malek comes off a little lackluster in his scene work in which he is a little too stiff and scripted, he has a booming, smooth vocal performance that is enthralling, especially in his featured numbers such as “Love, I Hear,” “Lovely,” and “Impossible.” Sandler, an accomplished music director in her own right, is a delight as the ditzy, beautiful blond and she plays the role to the hilt with good comedic timing and a lovely voice that rings out throughout the theatre. Don Patterson portrays Senex, the henpecked, hormone raged patriarch of the House of Senex, and Ande Kolp plays his wife, Domina, the take charge mistress with a strong libido. Patterson does well with this role and portrays Senex appropriately giving him a good blend of obedience to his wife and a wild streak when he sees a young lady he fancies. He has a good sense of comedy but his farce is a little too slow for my liking. However, he starts off one of the funniest numbers in the entire show, “Everybody Ought to have a Maid” and he completely gets and presents the humor of this number beautifully. Vocally, he can hold his own and, through his scene work and chemistry with the rest of the ensemble, makes the character quite lovable. 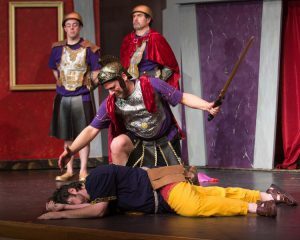 Bob Gudauskas tackles the quick and fast paced role of Pseudolus and Mat Scheer Matt Scheer takes on the role of Hysterium, the two slaves who, somehow, have to keep everything together throughout the production. Though Scheer gives a good technical performance, there doesn’t seem to be much urgency behind his character, physically. The character’s name alone, Hysterium, puts pictures of a hysterical, on edge, jumpy character in the minds of the audience but I simply don’t get this from Scheer. He plays him a little too subdued making his featured number, “I’m Calm,” a little forced and out of place. However, he does have a great presence onstage, understands the material quite well, and he works well with and off of his fellow actors making for a worthy performance. 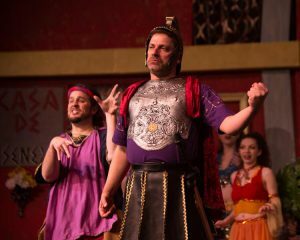 As Pseudolus, Gudauskas is supposed to guide the audience through the story and he does his superbly. He has a fantastic presence and does well vocally, but he too is a bit subdued for the role with no urgency. Also, he seems to understand the shtick and farce, but, as mentioned, it is a bit hokey and Gudauskas seems a bit forced and scripted at times. With that being said, vocally, he’s got a strong voice and is confident in his vocal performances, as in the opening number, “Comedy Tonight,” that gets the ball rolling. Overall, he gives a solid, charming performance making him a very likable character. 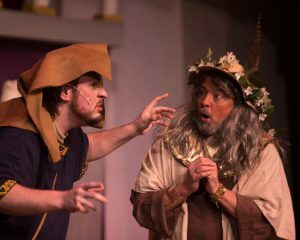 The definite highlights of this production are Richard Greenslit as Miles Gloriosus and Jeff Dunne as Lycus (is it just me of could these two almost be twins?). They are both hilarious in their respective roles and their comedic timing is on point. Dunne gives an impeccable performance as the sly, greasy, friendly flesh peddler next door and his facial expressions are second to none. His expressive eyes and gestures add great value to this character and to the production as a whole. He seems fearless of making a fool of himself and that’s one of the best characteristics a good comedian can have. He has a good grasp of his character and plays him in a way that is sleazy, but yet, still likable which is tricky, but of no challenge to Dunne. 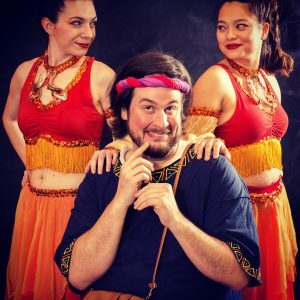 He’s a stronger actor than he is a singer, but he certainly holds his own and shines in his featured numbers like “The House of Lycus,” and “Everybody Ought to Have a Maid.” Overall, he gives an outstanding performance and will have you in stitches. Greenslit, as the manly, egotistical captain in the Roman army plays his part to the hilt and has a large presence with great facial expressions and gestures. Vocally, he’s a powerhouse with a booming baritone that resonates throughout the theatre, especially in his featured numbers such as “”Bring Me My Bride” and “Funeral Sequence.” Funny, confident, and giving a solid comedic performance, Greenslit is certainly one to watch. 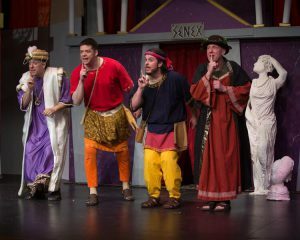 Final thought… A Funny Thing Happened on the Way to the Forum is a fun romp through ancient Rome with catchy Sondheim tunes performed by an able cast of crazy characters. Though the pacing is a bit off at times, especially when it comes to the farce, and some of the humor may be hoky and vaudevillian, but the zany story holds up nicely and is well thought-out. It’s clear that the ensemble gives 100% effort and each actor takes his or her role serious enough to emote the humor and absurdity of each character. It’s fluffy, it’s light, but it takes a certain discipline to pull off a comedy effectively (especially when a Sondheim score is involved) and, for the most part, this production is quite successful and makes for an enjoyable evening of theatre. This is what I thought of Silhouette Stages’ production of A Funny Thing Happened on the Way to the Forum… What did you think? Please feel free to leave a comment! 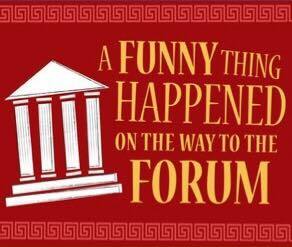 A Funny Thing Happened on the Way to the Forum will play through March 25 at Silhouette Stages, 10400 Cross Fox Lane, Columbia, MD. For tickets, call the box office at 410-637-5289 or purchase them online. This entry was posted in Reviews and tagged A Funny Thing Happened on the Way to the Forum, Alex Porter, Ande Kolp, Bill Pond, Bob Gudauskas, Conni Trump Ross, Don Patterson, Jeff Dunne, Jessie Krupkin, Linda Swann, Matt Scheer, Rachel Sandler, Richard Greenslit, Silhouette Stages, Tina DeSimone, Todd Hochkeppel, Tommy Malek, William Georg by Jason. Bookmark the permalink.